Kilig or creeped out? Netizens weigh in on the matter in droves! They say it’s first time in Philippine history. I say: That’s how special you are to me. @erichgg , will you drink coffee with me? Pretty bold. But hardly original and, considering the guy is not my type, to me rather creepy. Hi Darls!!! 🙂 How are you? Hahaha!!! Ang cute ng effort ni Kuya. It’s fine. Let’s see when I get back. 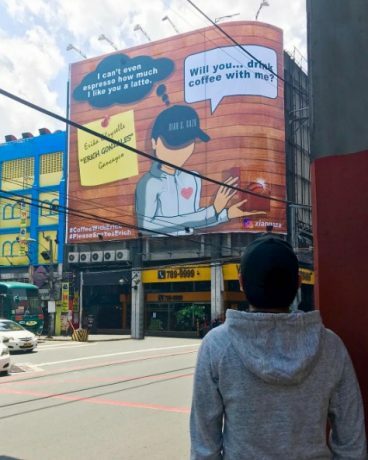 There’s nothing wrong naman if we talk over coffee, pero dapat kasama ka. Hahaha!!! See you soon Darls! I dunno. If I were a guy and the girl of my dreams called me “Kuya”, I’d take that as not a very promising sign — more so considering she plans to take along a chaperone! It gets me to thinking though. Why is it that certain pa cute works for some and doesn’t for others? Seeing all the flak Xian Gaza is getting all over social media, it seems obvious that his stunts don’t work. There’s also something to be said about the way he flaunts all the gifts he plans to give to Gonzales. I mean, dude get a grip! You’re coming on too strong! A theory stating that if two people are into each other, a big romantic gesture works, but if one person isn’t into the other, the same gesture comes off serial killer crazy. Dobler is the character Lloyd Dobler in the 1989 film Say Anything who, in a seminal scene, shows up with a boombox underneath his girlfriend’s bedroom window playing a song that they were listening to the first time they slept together. Jeffrey Lionel Dahmer, in contrast, is a serial killer who terrorised Wisconsin over the 1980s. Kilig or creepozoid? It’s all relative. Winning Back The Ex stunt, New York City c.2013. There is also this case of an anonymous man who, back in 2013, put up 600 posters all over New York City in an effort to win back his ex-girlfriend. He documented the project in the now-defunct website ThisIsHowYouWinHerBack.com. At the time, the stunt also generated a lot of the same debate on social media. Some Netizens said they reacted with an Awwwwww…. But others also found the stunt absolutely messed up and downright creepy. 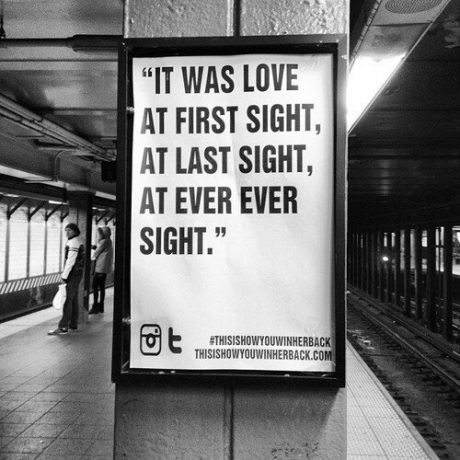 One thing to take note of, the NYC guy is anonymous and mysterious and the messages on his posters were all subtle. They seem to be inside jokes between him and his ex. In the case of Xian Gaza, he’s a very public flamboyant guy — which really does not sit well with crabby Filipinos who are quick to take issue with kayabangan. See, there really is no science behind courtship. One formula works on one person but is a total flop with another. It seems, it just didn’t work for Gaza. One tweeted, “Pretty sure that if Xian Gaza had the face of a supermodel the number of these hate tweets will go down by at least half lfmao.” I try not to be facist (and often fail) so I thought twice about going there, but now that I did, I might as well admit that the guy who let out that tweet is right. Ultimately you gotta be a Brad Pitt to pull off a corny courtship stunt. And, please, unless you’re a rock star, don’t think you’ll have me by pulling out a guitar and singing me a ballad. Rock stars get their money for nothin’ and their chicks for free — coz they’ve got talent. Next Article My timeline is filled with Fake News Crybabies! Unbelievable. The country is a slow-motion trainwreck and THIS is what holds the average Pinoy’s attention. Funnily enough, ‘guanxiqian’ translates approximately (depending on how you pronounce it) as ‘money obtained by cronyism’. Sounds like a very Filipino business. and this xian gaza flauting his wealth is such a turn off! Mr Gaza is one of the example of those people who’d make their romance a creepy story. Read this link from list.ph and he’s on the #1 list. First impression matters but consistent impression is where the proof is. Seriously Kate, if you look half as intelligent as you write, and you want out of that country…..HERE IS YOUR TICKET. I CANT POST A PHONE NUMBER, BUT I HAVE SCOURED THE COUNTRY,LIVED IN ALL THE REMOTE AREA BEACHES, and its time to go home. Wanna join me ? it is pretty easy to get an exit visa, its staying in the host country that can get difficult. That said Euro’s/USDollars/Dinero will not be a problem……and as long as you are not an Undecover €it£# ,I’d bet we could have ourselves A really good LTR ! GBTM……..
Just a late snipe…. but one can wonder whether things like this were deliberately set up as a distraction from the things that really matter.